Submersible water well pumps are used in residential deep water wells. 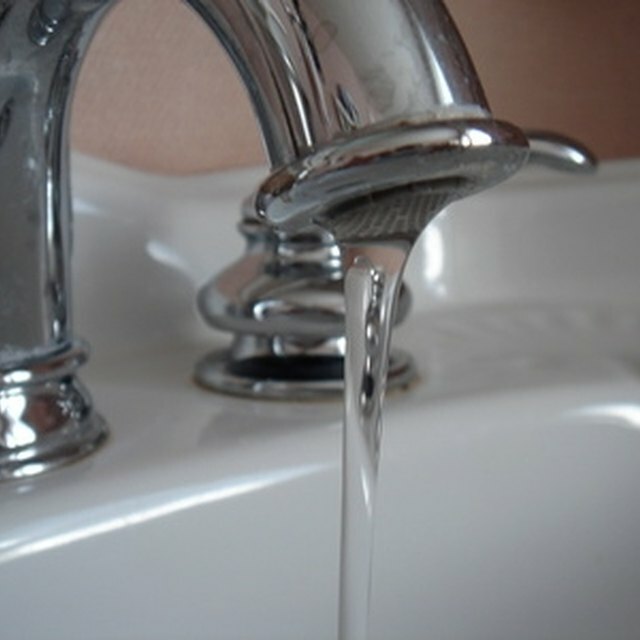 When you turn on a faucet, water flows out of the faucet and into a drain. The water is supplied from a holding tank that is pressurized. When the tank pressure drops below the cut-on or low pressure, the control switch turns the water pump on to re-supply the tank with water. When the tank reaches its high or cut-off pressure, the control switch turns the pump off. A short cycling pump will constantly click on and off and can burn the motor of the pump. Adjustments to the control switch will rectify this problem. Observe the pressure gauge on a water well when you make adjustments to the pump control switch. Place an adjustable wrench on top of the nut on the pressure control switch cover. Turn the nut counterclockwise and lift it straight up and off the cover. Pull the cover straight up and off the pressure switch. Observe a large spring with a nut on top of it and a small spring with a nut on top. The large nut adjusts the both the cut-on and cut-off pressure while maintaining the time gap between them. The small nut adjusts the differential or the time period between cut-on and cut-off. Turn the small nut clockwise with an adjustable wrench about one turn to raise the cut-off pressure. Open an outdoor faucet on the well so the well pump will start pumping water. Close the faucet after the well starts pumping. Observe the pressure gauge on the pump to see the reading when the pump cuts on and off. Most residential submersible pumps should have a cut-on pressure of about 30 psi and a cut-off pressure of about 50 psi. Make further adjustments to correct the short-cycling by turning the differential nut clockwise in small increments up to the cut-off pressure of the pump. Do not adjust the differential to a higher cut-off pressure than the pump is rated for. Replace the cover and turn the nut on top clockwise with an adjustable wrench to secure it. Do not touch any other wires or the metal contacts in the pressure control switch. The wires a live and are a shock hazard. Make certain that the pump cycle is off and does not run continuously. A well over-running can burn up the pump.